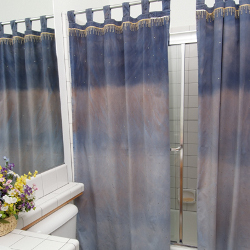 These moonlight inspired shower curtains are easy to make with fashion dyes from Tulip. Find this project from I Love to Create and many more fabric dye projects in the free eBook for fabric dye inspiration and instruction, Fun with Fabric Dye. Prewash curtain to remove sizing. Do not use fabric softener. Do not dry. Cover work surface with tablecloth. Lay curtain onto work surface. Wearing rubber gloves, add water to dye bottles. Replace caps tightly. Shake until dye is dissolved. Pour into separate spray bottles. Apply Brown One-Step Fashion Dye onto curtain, spraying lightly in some areas, darker in others. Apply Blue One-Step Fashion Dye, spraying to achieve a gradation effect. Cut beaded trim equal to length of top seam of curtain. Glue trim along seam, using Fabric Fusion. Prepare Cordless Heat-Setting Tool. Position a random pattern of Iron-On Crystals onto curtain as desired, using tweezers. Gently touch tip of tool onto top of each Crystal for 5 to 6 seconds to adhere. Tired of trying to find a shower curtain you like then make your own with a plain one and tie dye it with fabric paints. You can get so creative with this. Use different coors and maybe add a saying or a picture on it or leave it alone. Maybe even add some embellishments for a added touch. Nothing like creating a wonderful piece made by you.